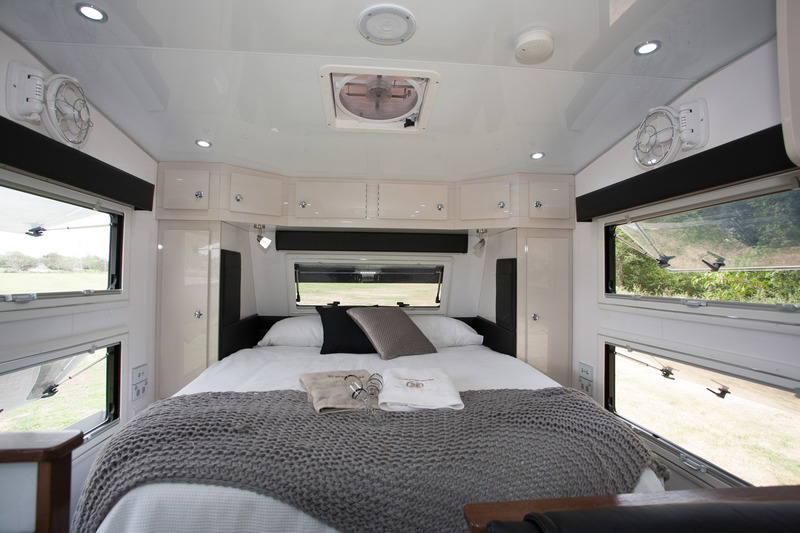 Kedron Caravan’s Topender TE5 is aptly named. Not only does it have the capability to get around the top end of Australia quite easily, it is also at the top end of the Kedron range. The TE5 model has been in the Kedron range for quite a few years with a good level of self-sufficiency in both the power and water departments, however the latest model not only has cosmetic changes but improvement in remote travel capability. Some things haven’t changed though. 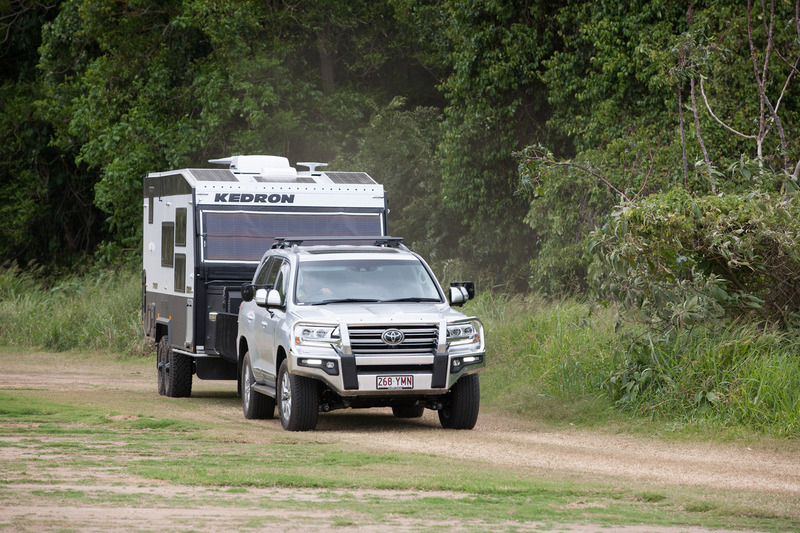 Just like the rest of the Kedron range, the TE5 has a chassis and the bodywork designed for offroad travel. Anyone familiar with the Gall Boys’ DVDs will know how the Kedron team get to test their caravans out in the field. The main chassis RHS rails consist of two 100mm x 50mm (4in x 2in) sections laminated together and larger 150mm x 50mm (6in x 2in) sections for the drawbar. Keeping the van firmly on the road is Kedron’s own KRS (Kedron Recovery Stub) independent suspension, complete with trailing arms, airbags, two shock absorbers per wheel and an auto levelling system. Roto moulded water tanks are fitted fore and aft of the suspension mounts. Above the chassis, the aluminium frame isn’t just rivetted together but interlocked and huck bolted, to give the necessary strength and rigidity. For any caravan designed for northern outback travel and conversely colder climate terrain, the van body is all insulated of course with Kingston Air Cell in the walls and Kingston Kooltherm for the roof. Externally the bodywork is Dibond aluminium clad with Rhino Coating for the lower waist areas. Most of the body fittings like the Aussie Traveller awning, double glazed acrylic windows and security door are standard caravan items but there’s one little feature that isn’t. The large polished metal button above the mid wall window is a vent hole for the kitchen rangehood and designed to be closed off when travelling to minimise dust entry — done easily with a long pole. Another item of interest is the solar panel that sits on the front window awning. One of the reasons for that placement is that with this van, most of the roof area not taken up by the air-conditioner, roof hatches and satellite dish, is plated with solar panels. External storage is quite generous. The front tunnel boot area is mostly taken up by a slide-out storage bin and there is a large storage box on the front drawbar which can hold both a generator and a chest-style fridge. In addition, there’s a separate compartment atop the storage box plus two jerry can holders, both totally enclosed. Just like the gas cylinder bin which is also enclosed to get around the problem of the close proximity of electrical plug connections. There are two more storage bins in the rear nearside wall and at the front offside, a more dedicated compartment for the electrics — battery management system, solar panel regulator, breakaway system and 12V connections. There’s a good reason for all those controls and switching because this particular van has a considerable electrical capacity with 400Ah of lithium battery capacity, 1200W of solar panel power, which along with 265L of fresh water supply gives a very good remote travel capability. Environmentally speaking, the only real limiter is the 60L grey water and 19L Thetford toilet cassette. Quite a few of the boutique caravan manufacturers in Australia have a distinctive look to their interiors and Kedron is no exception. Certainly, the glossy laminate finish, numerous downlights, marine style door catches and quite spacious feel, all result in that very Kedron look. One of the benefits of having glossy white upper areas, apart from adding to the natural light levels, also gives the impression of there being far less fittings than there really is. 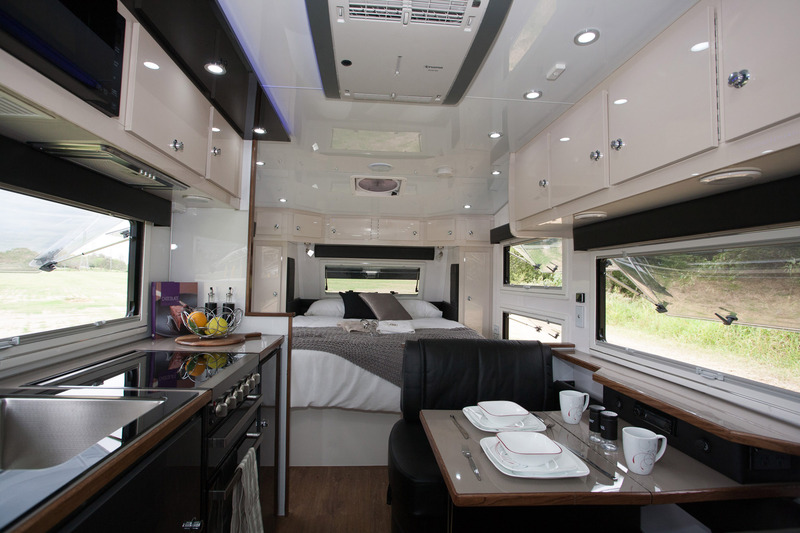 It's not a major feature but I reckon that having a bit of an identity is good, especially when the current layout of choice, that is a front island bed and full-width rear bathroom, is used like in this van. You do get the other essential features of course, such as the nearside kitchen bench and offside cafe-style dinette. The end result is quite a spacious van with all the expected features, including well placed 240V and 12V/5V USB sockets. I reckon that one of those essential features in any sophisticated van these days is a centrally located control panel, something this van certainly has. Located in one of the overhead lockers above the kitchen bench, the panel contains the Truma iNet (water heater/space heater) panel, water tank gauges, battery management system and 12V switching and fuses. Adjoining that panel is the satellite TV control. All handily located in the one place. Getting to more of the home comforts, up front the queen-sized bed sits slightly higher off the floor than usual, mostly to accommodate the front tunnel storage but that also results in a decent sort of storage area underneath. Windows all around the bed create a well ventilated and naturally lit area. I particularly like the twin window setup that retains a good window area whilst reducing the security risk of a single large window. Even without the air-conditioner, there’s still a good air flow system with the Maxx Fan and two Sirocco 12V rotating fans. In the mid area, both the kitchen bench and cafe-style dinette are well sized. Both have a decent amount of benchtop/table area and the dinette even comes with an extra shelf under the window as well. In keeping with a luxury van, the black leather upholstered seating not only looks good but is comfortable to sit on as well. Of course, the kitchen bench comes fully equipped with a four-burner cooker, grill and oven, plus a stainless steel sink and LG microwave oven in the overhead locker space. On the opposite side in the corner by the bathroom, the 218L fridge is a little different. It’s a fridge/freezer unit but the fridge is above, and the freezer drawer is below. It’s well-sized. Between the fridge and the dinette is a full-height but stepped cabinet with cupboard above and cupboard and drawer below. It certainly makes a good pantry area. In the rear, the bathroom comes with a well-sized shower compartment and a decent sort of vanity cabinet that includes a pedestal style wash basins, cupboard space and a Daewoo wall-mounted washing machine. There is of course the expected Thetford cassette toilet and a not-so-expected mid wall ventilation system — now that's good thinking! 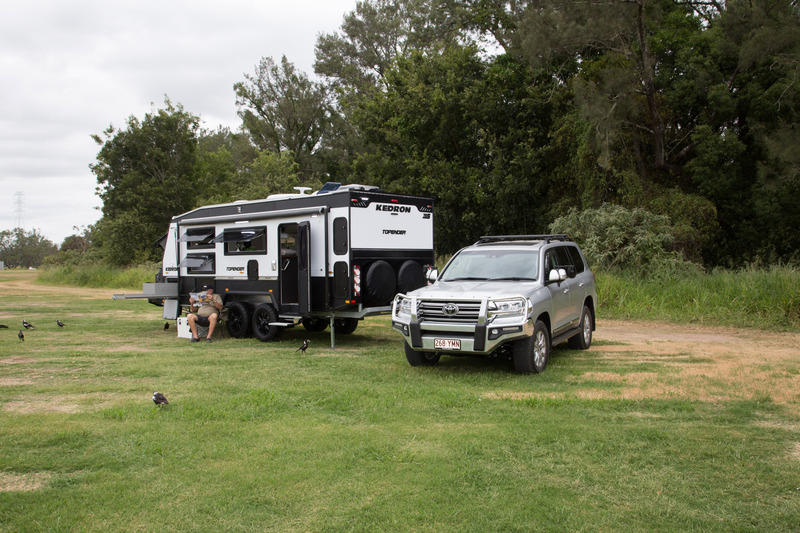 I noted in my opening comments that the Kedron Topender TE5 van is at the top end of the Kedron range and it certainly has all the luxury fittings that go along with that in a well-appointed caravan. In addition, being a Kedron product, it comes with all the essentials for some serious offroad travel in a van that is built from quite a few years of offroad experience.